A man who caused the evacuation of more than 40 homes has admitted keeping dangerous chemicals at his house. Gert Meyers, 55, had been selling the chemicals online without a licence from his Oxford Street home in Bridlington. A police raid on the property in August led to a two-day incident in which an army bomb disposal unit had to be drafted in. 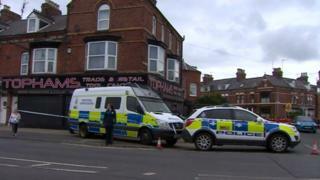 Beverley Magistrates' Court heard some of the substances involved were used in a unrelated serious crime. Humberside Police said Meyers legally sold substances to two people who were subsequently prosecuted for terrorism offences. Det Ch Supt Matt Hutchinson said: "This may not have been illegal at the time, however he should have been more responsible for who he was supplying these potentially dangerous substances." Speaking after the hearing, Meyers said a Home Office official had visited him following a change in the law and told him that he needed a licence for some of the chemicals. However, he said he "forgot" to apply for one. Meyers was released on bail and will be sentenced at Hull Crown Court on 27 April.